The Vanity Fair Vintage Lifestyle lets you express your romantic side and create soft vintage and calming rooms to celebrate the true beauty in home decor fashion. Perfect for hopeful romantics, bohemian fashion lovers and for those who love to design more feminine spaces for bedrooms, dining rooms and personal havens. For this moodboard lifestyle, color stories are delicate, sweet mixes of calming hues in soft blues and greens, like azure blue, silver sage and the Benjamin Moore 2012 Color of the Year: wythe blue. For upholstery selections, choose flirtatious curved frames in washed wood finishes, old-world vintage tufting and use a mix of fabrics: soft velvets, rich silks and relaxed linens. 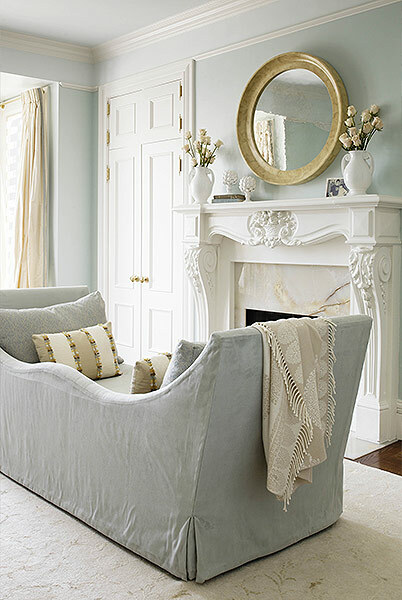 A perfect fit: the Greenwich Sofa featuring a classic style by Home Decorators Collection. In celebration of the New Year, it’s a fabulous time to create a beautiful haven for sleep and special relaxing spaces with cozy fabrics and calming colors. For beds, choose the comfort and luxury of upholstered headboards, like the understated glamour of the Sophia Upholstered Tufted Headboard: a celebration of the Victorian era from Layla Grace. When creating gorgeous bedroom and dining rooms, select case pieces that evoke the beauty of the ages and make sure to find a few grand scale pieces to make a fabulous home decor fashion statement! One of our favs: the Brenton Armoire with hand-painted Versailles finish, crystal hardware and wire mesh doors by PoshTots. For more glamour, add metallic finished pieces and mirrored accents, like the Borghese Mirrored Hall Chest from the Home Decorators Collection and pictured above: Andrew Martin Steel Chest of Drawers by Occa-Home. For the Vanity Fair Vintage Lifestyle, add layers of beauty & drama to every room with various sizes of area rugs. 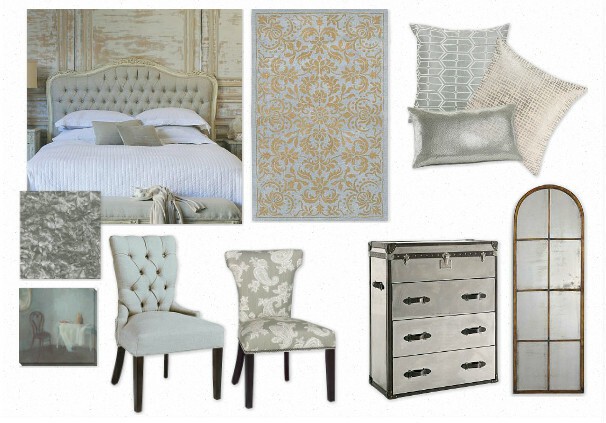 Choose a soft mix of classic patterns with touches of modern and feminine curves. Like the Modern Classics hand-tufted rug designed by Candice Olson of Divine Design from Layla Grace and the baroque Chandelier Rug by cb2. Accessorize. Accessorize. Accessorize. Home accent like you mean it! 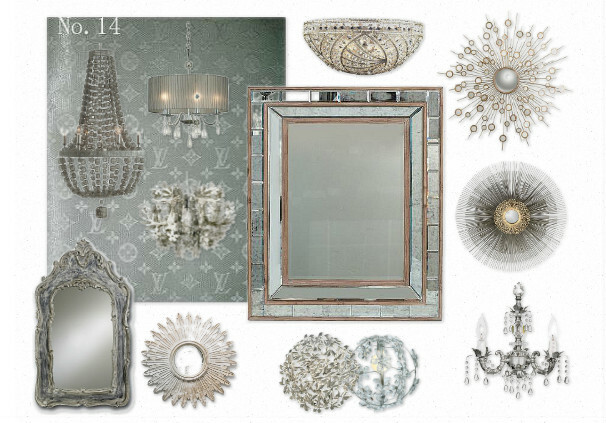 Every Vanity Fair Vintage room needs splashes of decor accessories: mirrors in metallic finishes and ultra glam chandeliers to express the home fashionista inside of you. One of our glamour favs, the Starburst Mirror inspired by a mid-Century antique from Crate&Barrel. Featured above: a fabulous Vanity Fair Vintage Lifestyle room via Interior Designer Stacy Naquin and showcasing the Benjamin Moore 2012 Color of the Year. 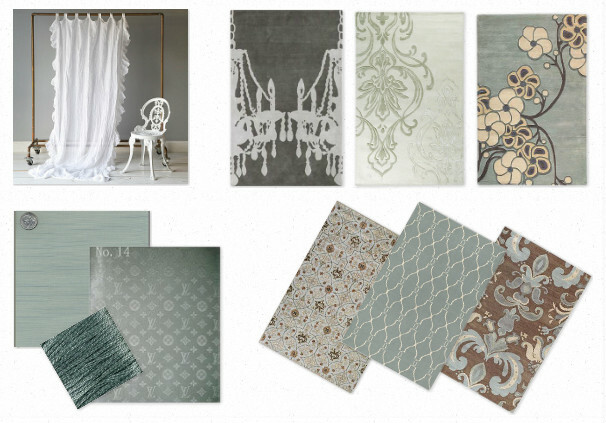 Make sure to visit Stacy Naquin Interiors Blog for more design inspiration and to view her complete designer portfolio. 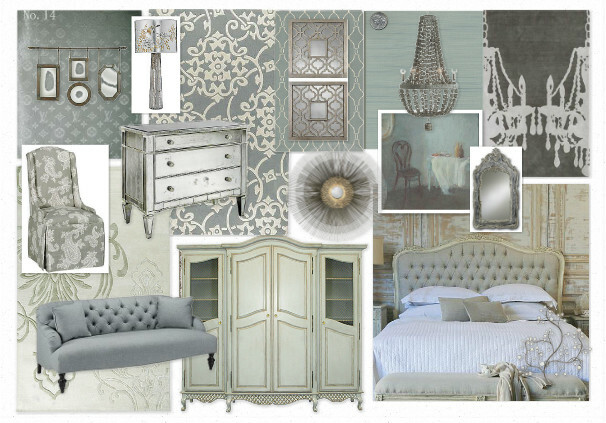 You can also see her fabulous moodboards here.